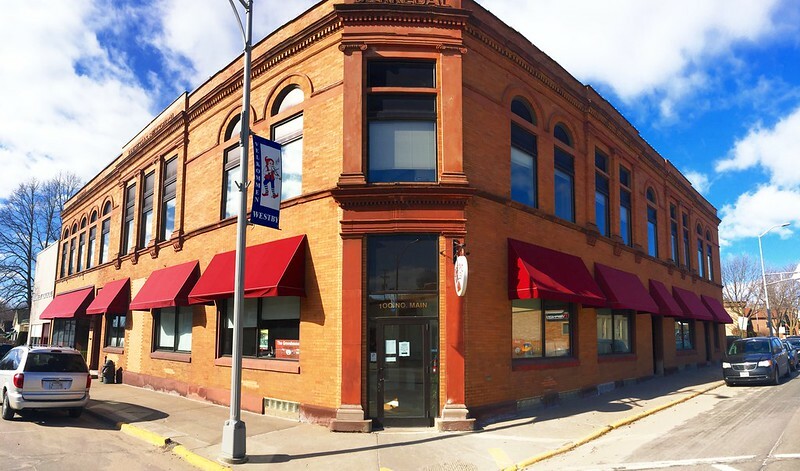 so long, old bank building! almost three years ago we had a fire at organic valley headquarters and almost two and a half years ago to help make space while they rebuilt the burned portion of the building, the marketing department ( including me ) moved to a an old bank building in a town where if you look closely you might detect a hint of the local scandinavian heritage. after work was done at hq there was still no room ( we’re always GROOOOOOWING! ) so we stayed in the old bank while work was being done on new work digs WHICH ARE NOW DOOOOOOONE! which means after 3 years of all of us feeling like we’re in a temporary situation that’s not so temporary, we’re all finally moving into a nice, new building with all kinds of nice, new amenities and i really couldn’t be happier. 159/365. the refurbished westby norseman. 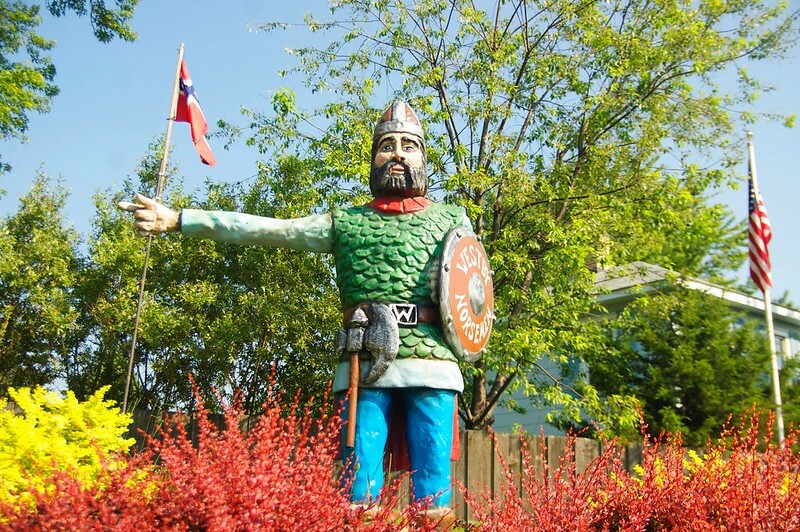 since 1999, the norseman stood in westby wisconsin ( they do love their scandinavian heritage, carved out of a tree trunk. but over the years it, wear and tear took it’s toll. a few years ago the arm broke off and it looked as if its days were numbered. but a group of folks got together and raised the money to create a refurbished statue made out of fiberglass which will, hopefully, stand the test of time. he’s got a bit of a nordic lumbersexual thing going on. day 3970 – 136/365. 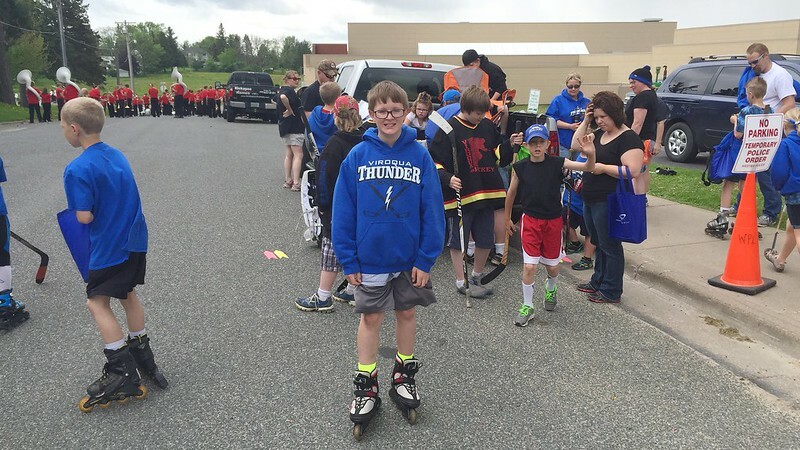 odin represents the hockey association during a local syttende mai parade. we got together around 20 players and parents to hand out syttende mai parade ( in honor of norwegian constitution day. yes, this is the same town where, if you look closely you might detect a hint of the local scandinavian heritage ). sometimes i’m surprised at how badly i can fail at capturing the moment. no posed shot of all the players on the truck. no action shot of them rollerblading around the float, handing out candy. no good shot of the truck with the great looking banners we had made. sigh. 118/365. 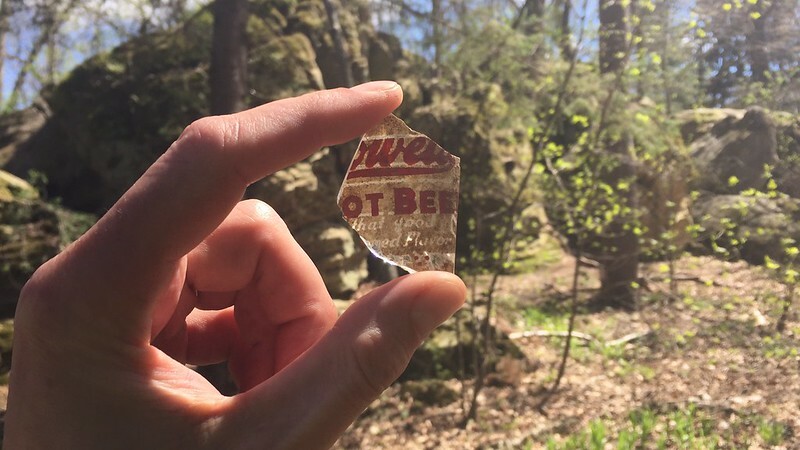 shocking evidence of drinking found during local park clean-up day. i thought I’d find lots of evidence of underage drinking while cleaning up a local westby park with work peeps. the park has lots of spaces to hide shenanigans so I was surprised to find nothing but one shard of what appears to be a root beer bottle. pondering the ethics of five finger discounting the gnome salt and pepper shaker holder. with odin and kris, eating lunch at borgen’s cafe in westby, wisconsin where you don’t have to look far detect a hint of the local scandinavian heritage. 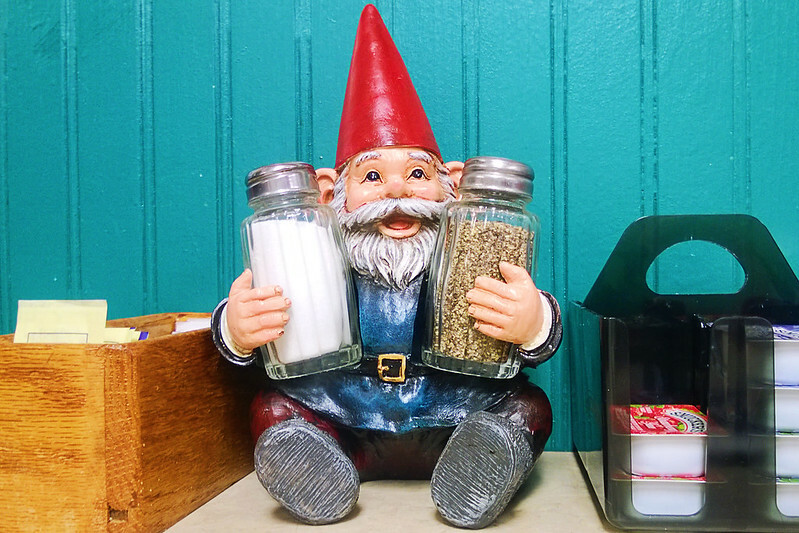 we wonder where we might be able to score the gnome salt and pepper shaker holder on the table? i think one might look great on our kitchen table. i know it’d be wrong to just take him home. the view from a gorgeous driftless lunchtime run. it’s impossible to convey the beauty of the view from the top of the ridge just a mile from my desk at organic valley. maybe a picture is worth a thousand words. the view of the classic driftless region geography makes for quite an energizing “out and back” lunch run even on a dull day, all the more so when it’s sunny, green and lush. do yourself a favor and view large on a big screen. finding a new home for the old me. 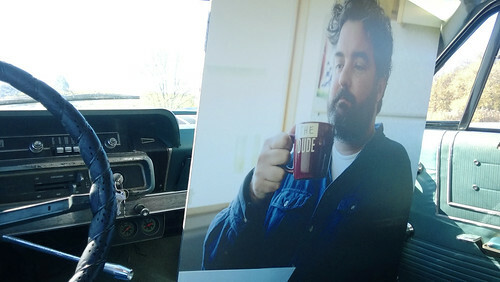 for over a year this photo of me has been hanging in the organic valley headquarters near the coffee station where i used to get coffee every day before the fire. the photo was taken right before i started running again, before i ran clear across the country and before i lost 110 pounds. so, it’s a good reminder to not let that happen again. a little birdy told me that the picture was coming down to make way for a new one, so i thought i’d proactively “steal” the picture and put it somewhere where it might be appreciated. i knew i wanted to put it up in our post fire work digs in westby but i couldn’t put it up in my office because, well, that’d be weird, right? 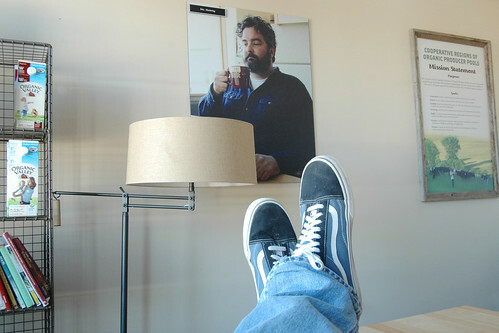 aha – i found the perfect spot in our executive marketing director’s office! i just know lewis would really enjoy having me looking down on him at his desk.